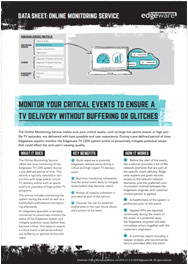 Monitor your live TV CDN online to avoid potential issues that could affect the end user’s viewing quality for live sports events or high profile TV episode. The Online Monitoring Service makes sure your critical assets are delivered with best possible end user experience. During a pre-defined period of time Edgeware experts monitor the Edgeware TV CDN system online to proactively mitigate potential issues that could affect the end user’s viewing quality. This helps to ensure a critical event is delivered without any buffering or glitches to the end users.